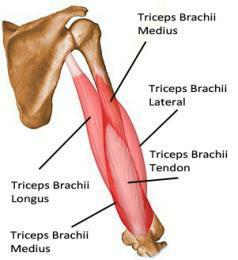 The Triceps are located on the back of the upper arm and make up two thirds of the arms girth. There are three primary heads or divisions to the muscle group and their job is elbow extension with the long head contributing to shoulder extension as well. Many people (you now who you are!) tend to focus on the traditional biceps curl (elbow flexion) to increase size and definition in their arms rather than tending to their Triceps. If trained effectively and you get your bodyfat low enough by incorporating a diet that eliminates grains, they are an impressively defined muscle group creating an almost horseshoe-like appearance. The Cable Stack affords many options but usually some type of bar and a rope or straps are chosen. Most often the exercise is called the Pressdown. The difference is in the grip and the position of the wrist once the grip is chosen. A cambered bar places the bar in a somewhat supinated, (palms up), forearm position instead of the palms down, (pronated), position. Performing a Triceps Pushdown in the pronated position is not advised, as not does not take into account the carrying angle, (outward angulation of the lower part of the arm, btwn 5˚-15˚ away from the body), of the elbow joints and the Triceps cannot ‘unwind’ to fully straighten the elbow. This usually causes the elbows to flair out from the sides and internally rotate the shoulder placing undo stress on it, and the biceps tendon. A ‘neutral grip’ bar places the forearms in a halfway-supinated position and is also a great option. Rope and Straps. The traditional triceps rope, is well, too short. To extend the elbow fully, the rope must be pulled apart at such a drastic angle that compensation (cheating), usually occurs. Extra effort must be imposed to pull the handles apart as well as downward. A more effective option are ‘straps’, (purchase them HERE), which are much longer, lessening the angle and providing a multitude of grips, reverse grip, full supination, being the caveman’s favorite option. Think of Rubber Tubing as a portable, (and inexpensive), cable stack. Whatever grip or movement you chose on the stack can easily be performed with a tube slung over a hook in the ceiling or some other highpoint anchor. The difference with tubing is that it is not weight-based yet still Resistance. Remember from Priority #2 that an integral part of exercising efficiently and effectively is ‘rotating your tires’ to ensure variation and progression. In fact, using different types of resistance for the same joint movement or targeted muscle challenges the nervous system to make the system stronger as a whole. The most effective use of Dumbbells on the Triceps is lying with two, and lowering them down by the ears. Try it on a ball, together, alternating, and with even a slight incline or decline on the bench. AVOID, the epitomes single dumbbell behind-the-head exercise. Bad wrist position, head cocked to get out of the way, internally rotated shoulders, and resistance increasing as the joint is weakening. Some cool Variations? Check out the video at the top! Most of the people I know workout with sunglasses on and are all oiled up..you?